For my very first post of 2015 I would like to share with you a card that I created using Snow Buds digital stamp from Pollycraft. I started with a card base that would open from the bottom instead of the side. ( I have a habit of creating cards that all open from the side and I'm trying to break myself of this habit.) 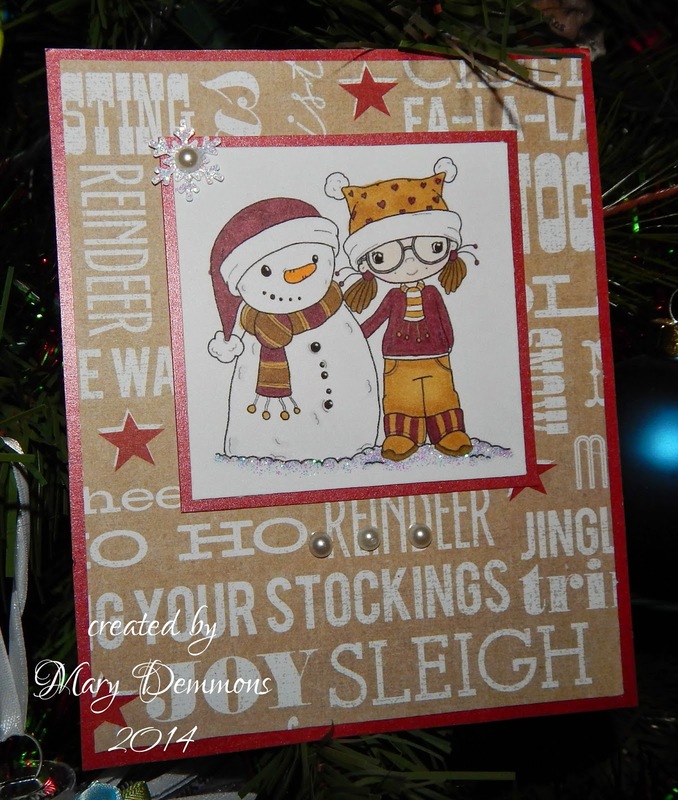 I added a piece of Christmas patterned paper backed in a red pearl card stock to the card base. I colored the image using Spectrum Noir pens. (The tan on the image looks like it has more of an orange tint to it in this picture than the actual card does.) I backed the image in a red pearl card stock. I punched a small snowflake using a Martha Stewart snowflake corner punch, added a pearl to the center and placed it in the corner of the image. I also added crystal stickles to the snowflake and a little to the image. I finished off my card by adding 3 pearls under the image. Wonderful winter friends, love it! Thanks for joining us a Catch The Bug! Thanks so much for joining us for our ANYTHING GOES Challenge this week. Pop back soon to see if you’re a winner, and to join in the new challenge here at Bugaboo’s Catch the Bug blog. Beautiful card, such a cute image and great papers. Thanks for joining us this week at Eureka for our Snowman or Snowflakes Challenge.